A special type of high-temperature fabric expansion joint developed by U.S. Bellows, Inc. is the furnace sealing bag. The objective of the bag is to seal the air inlet conduits’ penetrations into a furnace and thus prevent heat loss. Because of thermal expansion of both the conduits and the furnace, the bag must be able to expand and contract during normal cycles of operation. conduit (usually a pipe) so as to form an airtight seal. The connection to this pipe is made such that the fabric is collapsed when the furnace is cold and extended when the furnace is hot. When required, a tapered coil spring formed from suitable metal is installed around the conduit inside the bag. This prevents the fabric from collapsing inward during vacuum conditions inside the furnace. For most applications, band straps may be used to attach the bag at both ends. Read more in this technical bulletin on High Temperature Furnace Seal Bags. 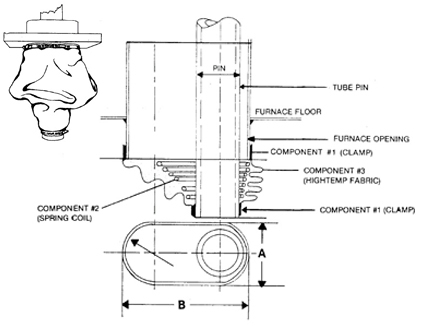 Openings between the floor of the furnace and the pipe penetration openings can cause heat energy loss in certain types of furnace applications. A penetration bag type seal is now available to prevent energy loss through the pipe penetrations during the expansion and contraction movement of the pipe through the furnace floor. The use of a furnace seal bag permits movements of the pipe through the furnace floor while providing an airtight closure to prevent heat loss. Fabric expansion joints are often used in ducts which carry hot gases at very low pressures. Layers of different fabrics and insulation can be combined to accommodate the temperatures and pressure in the system. Fabric expansion joint applications include, air and flue gas duct systems, flue gas desulfurization systems, gas turbines and diesel engine exhaust, incinerators, etc. Materials for fabric expansion joints include: silica cloth, mineral wool insulation pillows, PTFE coated fiberglass, ceramic fiberglass and aluminum coated fiberglass. A special type of high temperature fabric expansion joint developed by U.S. Bellows, Inc. is a furnace sealing bag. The objective of the bag is to seal the air inlet conduits penetrations into a furnace and thus prevent heat loss.